Beat the heat with a sweet treat from Outback Steakhouse. 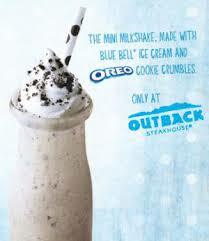 From now, through July 31st, you can pick up a FREE Oreo Mini Milkshake at Outback Steakhouse. Between the FREE Bloomin Onions and now this that we have seen lately, Outback is on a roll!